The film about our auction site went out on BBC One last night. You can watch it on the One Show's website here if you like. It was truly bizarre to see Dom Littlewood sitting next to Burt Bacharach talking about it. The traffic this generates is incredible (as the comments testify) and the site is still running like treacle this morning. Ironic that Amazon Web Services announced a Beta of Windows Server and SQL on the very same day. Windows Support - Beta level support for Microsoft Windows is now available on EC2, in the form of 32 and 64 bit AMIs, with pricing starting at $0.125 per hour. Microsoft SQL Server is also available in 64 bit form. That could have made last night a walk in the park. I'm off to West Dean again this morning, so in honour of Edward James' patronage of the famous surrealist consider yourself reminded that André Breton's sarcastic and anagrammatic nickname "avida dollars" is to Salvador Dali as "A Welsh Born Icon" is to Nicholas Browne. The Bomber is the Arsenal supporter. I'm, at best, a step-gunner or gooner once removed. That said, I did settle down to watch the Fenerbahce match last night. The last minute goal scored by Aaron Ramsey (born 26 December 1990 in Caerphilly) has persuaded me to install him as the youngest ever Welsh Born Icon, and to start feeling old. I found out yesterday that the great Ken Campbell died in August, and then today that Bernie Mac died in the same month. Invisibility is merely a matter of being able to hide in front of things. Do not touch my TV, my DVD, my stereo, my dual-deck VCR. Do not touch my old school, my new school, my slow jams, my party jams, my happy rap, and you better not touch ........ my James Brown. How'd that happen? Both will be sadly missed. Happy as I am with the Aspire One running Linux, it is becoming clear to me that if I am to use it as a day-to-day machine, I am going to need to run some Windows apps. I could try Wine, which is an Open Source implementation of the Windows API that can run on Linux, but if I do I foresee problems with USB and I want to be able to connect my Garmin 305 and Nokia N95 and run their respective Windows only interface programs. It seems to me therefore that full virtualisation via Sun's VirtualBox is likely to be the way forward, especially as the burglar runs XP on his Aspire One already and if I can get an image of that I can save some set-up time and aggravation. Further and better, John Green has already done the job and explains the wrinkles here. I cycled to Whitton yesterday (over 18 kilometres in the saddle), and had a couple of pints in the newly refurbished Admiral Nelson with a few of the boys before they went off to see the Harlequins demolish Ulster. Then I wandered up the High Street with Bondy and paid for my place (and that of the Bomber) in next year's skiing trip to Kitzbühel. After that I went back to the pub for a few more drinks with a few more mates, then got a cab home early in the evening (with the bike in the boot) and watched Kate Williams (late of this parish) floating around presenting a one hour BBC Timewatch special on ‘Young Victoria’ on BBC 2. She remains as easy on the eye as I remember. Andrew Sullivan: The blogosphere has added a whole new idiom to the act of writing and has introduced an entirely new generation to nonfiction. It has enabled writers to write out loud in ways never seen or understood before. And yet it has exposed a hunger and need for traditional writing that, in the age of television’s dominance, had seemed on the wane. Myself: Not here it hasn't mate. The World Bank has an Application Programming Interface! We are releasing this API because we believe this information can be mapped, visualized and mashed up in an unlimited number of ways that will help develop a better understanding of trends and patterns around key development issues. I don't know if this is genius or lunacy. I have applied for a key. Watch this space. I can't help but think that the Queen's trip to Google yesterday was a PR triumph both for the Palace and the company. Equinox Drama Productions are hosting New Comedy Scene 2008 this week in the ColourHouse Theatre. "10 original comedy plays by new playwrights will be showcased to make the public laugh", so the burglar and I went along last night to show willing. We saw "The Man Who Loved Elephants" and "Godplay". Consider that added to my to-do list. I've started adding comments to my own posts lately, to collect tips and trick for the Acer Aspire One or to record the continuing career of the Jabmeister etc. I want to use a comment to link my discovery of Haruki Murakami to his year 2000 alternative universe Nobel Prize. I was even invited yesterday (by way of a comment on a three and a half year old post) to a party in honour of a hero of mine. Comments are important, and I need to make them more prominent. There is an RSS feed of comments at http://nickbrowne.coraider.com/feeds/comments/default, just as there is an RSS feed of posts at http://nickbrowne.coraider.com/feeds/posts/default. I've used the feed to pop a list of the last five comments towards the top of the template on the left. If you've got any thoughts, leave a comment. The credit crunch can't help but make me think of the bank run in "It's a Wonderful Life". In particular there is a lot more Mr. Potter than George Bailey in our monomaniacal Prime Minister. Remember that we used ant-terrorism legislation against Iceland last week. How the Government be trusted now, not to misuse any other anti-terrorism law? While the world and his wife is praising the great Economist Statesman to the skies, let's observe that we ain't out of the woods yet. The money to be "invested" in the Government stakes in the banks will have to come from issuing bonds, so it will increase the national debt, but I bet you they'll keep in off the books by classifying it as a financial transaction with no asset implications because the shares purchased have the same value as the money used to buy them. Compare and contrast the Private Finance Initiative con. I wonder what the real National Debt will be at the end of this year? At least, thanks to the House of Lords, I can't be banged up for 42 days for speculating. Mr al-Maliki’s harshest words were for the actions last year of British troops in Basra, which came under Britain’s responsibility after the 2003 invasion. “They stayed away from the confrontation, which gave the gangs and militias the chance to control the city,” he said, referring to a decision by British Forces to leave a palace in Basra for their airport base. I blogged the move at the time. The post and its links are very dispiriting in the light of such a comment. Michael Yon's reports from the front are a useful corrective because - unlike Press Release and editorial writers - he is actually there. Read Death in the Corn about C-Company 2 Para in Helmand. "Who whom?" I am not I; thou art not he or she; they are not they. I checked out the new Brideshead Revisited movie, in spite of lukewarm reviews and was pleasantly surprised to find it reasonably true to the book. That is to say - ahem - divine grace being the sovereign favour of God for humankind — especially in regard to salvation — irrespective of actions ("deeds"), earned worth, or proven goodness; the errant quartet of His Lordship, Julia, Sebasatian, and even Charles are saved. Changing the plot to have Julia bowl up in Venice, or having Sebastian and Charles swap saliva are comparatively trivial in comparison, though I was bemused as to why the actor playing Bridey chose to model his performance on Groucho Marx. French novelist Jean-Marie Gustave Le Clézio has won the Nobel Prize for Literature. I've never heard of him. Ted Giola has compiled "The Nobel Prize in Literature from an Alternative Universe". Imagine a world in which such honors are exempt from pettiness, politics and tokenism. Imagine a Nobel Prize in which the contributions of Proust, Kafka, Nabokov and Joyce are not forgotten. Imagine a Nobel Prize in Literature in which genre writers have a chance. Imagine a Nobel Prize in Literature that doesn't bend over backward to exclude native born U.S. writers (only three honored during the last 52 years!). DR Congo is on on my mind, as inspired by MacKenna's posting I'm reading Tim Butchers's Blood River. 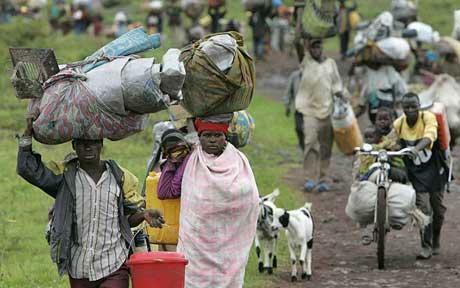 Things are getting desperate again in the East, on the border with Rwanda. See this BBC report including quotes from Alan Doss, Rod's boss. That ignorance is quite an indictment of me. Wimbledon Bookfest 2008 is running this week, but what with one thing and another I've only been able to get along to one event; Leo Hollis last night on his book (deep breath now) The Phoenix: St. Paul's Cathedral And The Men Who Made Modern London. I bought a copy for £20, but got him to write "IOU £20" as the dedication when he signed it, thus making the deal neutral. Perhaps with innovations like that, I should be advising the Chancellor on his £500 billion bank bailout scheme? Come to think about it, even though I've actually got a postgraduate degree specialising in international finance, I do find myself tempted to shout out "double or quits" whenever a talking head on the TV spouts one of these extraordinary figures. In these days of near ubiquitous body art, what are the rules on reading another man's tattoos in the locker room? ANNIE: (Laughing) Oh, I see, I see. ALVY: 'cause, uh, you never know what's gonna happen. What is most appropriate; peripheral vision, a glance, or a frank stare? What about spelling mistakes, or grammatical errors? Is it impolite to point them out? What we have here is a showbiz memoir from a star whose gilded cage was no metaphor; who views the great days of Hollywood in zoological terms. It's a brilliant idea. Naturally, as befits the memoir genre, Cheeta defines himself as an actor (“I'm a comedian, not an intellec- tual”). Naturally, too, modesty does not prevent him from pointing out that, in his great middle-period work on the Tarzan pictures, he was a pioneer of “simian thespianism”. How much of his success in films was down to him being an animal? Cheeta will accept it's as much as 10%; the rest, however, was talent. In common with every other showbiz memoirist, he claims never to read his reviews; he then quotes them extensively. He mentions several times that he never won an effing Oscar. He will recall a great star such as Rex Harrison by first calling him “that marvellous light comedian”, then getting down to the more interesting truth (“universally despised, impotent, alcoholic”), before coming properly out with it: “an absolutely irredeemable c*** who tried to murder me”. And, like many another stellar memoirist, he can't resist a vicious sideswipe at a fellow thesp. “For three decades I think I ‘phoned it in' a bit,” he confesses. “It happens to actors. Look at De Niro.”. I read and finished Haruki Murakami's What I Talk About When I Talk About Running yesterday on the train to and from a Muay Thai promotion. I picked the book up as an offshoot the idiot-participatory-martial-arts strand of my recent reading, and was very glad that I did. It reminded me, with its deceptively simple but artful voice, of Kurt Vonnegut's non-fiction; and I revere Kurt Vonnegut's non-fiction. Pleasure indeed to stumble on an author with a twenty year back catalogue for me to work my way through. 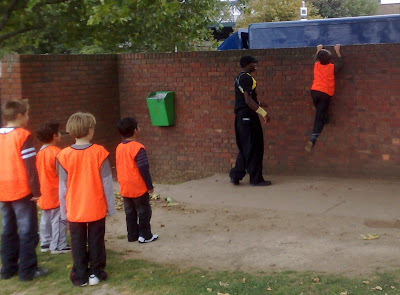 I contacted Urban Freeflow after we saw them at the Thames Festival, to see if we couldn't organise a lesson for the bomber and some chums as a birthday treat. Fate played the straight man, so here he is trying to run up a wall yesterday under the supervision of UF's Cali while his mates look on. Cali was a real gent; a pleasure to deal with setting the thing up then really great with the kids on the day (which can be harder than it looks). Good memories. Here's his show reel. Nearly two years after I begged for it, Amazon have announced that "starting later this Fall, Amazon Elastic Compute Cloud (Amazon EC2) will offer you the ability to run Microsoft Windows Server or Microsoft SQL Server". Potentially this is hugely attractive. The One Show has about seven million viewers. When the film about our auction system gets broadcast later this month, our servers are going to get absolutely hammered for a few days. I've got enough bandwidth for the job, but at the moment I'm scrabbling around trying to get hold of extra hardware to rent for the demand spike. As I understand it (a cursory understanding at best), EC2 works by creating virtual instances of servers. You can boot new and destroy old instances instantly. I wonder how Microsoft's server scaling will map onto this environment? You pay for the services (monthly in arrears) in instance hours; 40cents for a Large Instance (7.5 GB of memory, 4 EC2 Compute Units (2 virtual cores with 2 EC2 Compute Units each), 850 GB of instance storage, 64-bit platform) for example. Microsoft licenses will be more obviously. Data transfer is $0.100 per GB – all data transfer in, and 0.170 per GB – first 10 TB / month data transfer out. Persistent storage is in Amazon S3. I may have got some of this wrong, and there may be US versus Europe wrinkles I'm missing but a watching brief is definitely in order. Speaking of skiing companions, I have to pay for the me and the bomber to join Bondy's 2009 jaunt by 25th of this month. JK: Which one his [Niall] Hickman (Daily Express)? You are out of order. Absolutely f------ out of order. If you do it again, I am telling you you can f--- off and go to another ground. I will not come and stand for that f----- crap. No f------ way, lies. F---, you're saying I turned up and they f----- off. JK: I've f----- read it, I've read it. JK: You are trying to f------ undermine my position already. JK: F--- off. F--- off. It's your last f------ chance. I've now got my little linux AAA1 driving an external monitor at a decent resolution and running a variety of remote access software. This means that I can plug it in at work and access all my other machines from it. I've also managed to replace the cut-down front end that Acer load on the machine with the more useful complete Xfce desktop. Next vague tasks are Microsoft interoperability tasks are network access to files (SAMBA?) and PPTP VPN access. As a University College Swansea graduate myself, I have been delighted to find out that Alan Cox and the Swansea University Computer Society played no small part in the evolution of this operating system. He sorted out the networking. Only connect. I finished reading "Last Tango in Aberystwyth" last night, and will now pass it on to The Profit Burglar who attended University College Aberystwyth back in the day. Hughesovka? Sure, private detective Louie Knight had heard the stories, he'd heard about the legendary replica of Aberystwyth built in the Ukraine by some crazy nineteenth-century Czar. But he didn't believe it. He thought it was all phooey, just a land for dreamers and romantics where every house was an ice cream castle in the air. But all that changed when the museum curator of the fabled Shangri-la turned up in his office with a wild and crazy tale of love, death, madness and betrayal. Forced to swallow his scepticism, Louie is soon adrift in the neon-drenched wilderness of Aberystwyth Prom, pursued by snuff philatelists and a renegade spinning wheel salesman, and clutching two most unlikely talismans - a ticket to Hughesovka and a Russian cosmonaut's sock.Aberystwyth's only private eye and his sidekick Calamity Jane return as they swap the train to Dovey Junction for the Orient Express and try to unravel a murder mystery that is bizarre, even by their own exceptional standards.